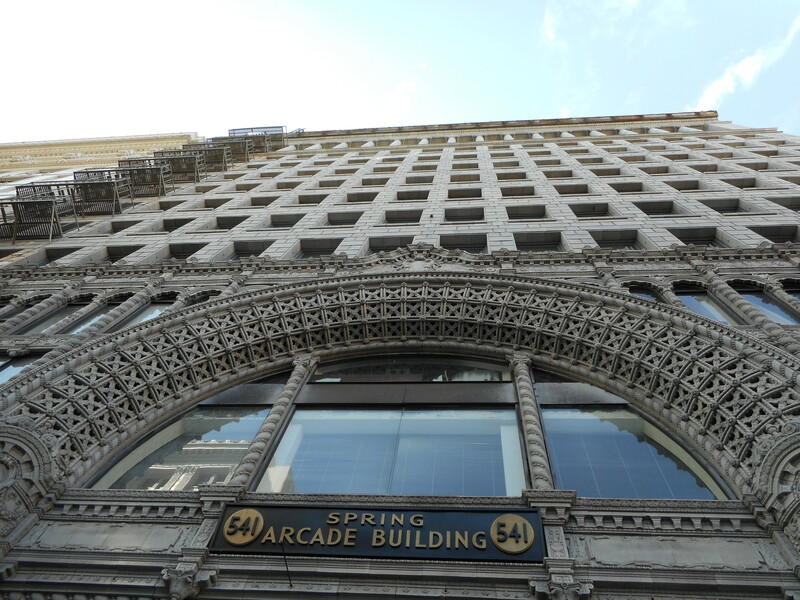 The Arcade Building has straddled Broadway and Spring Streets since 1924. 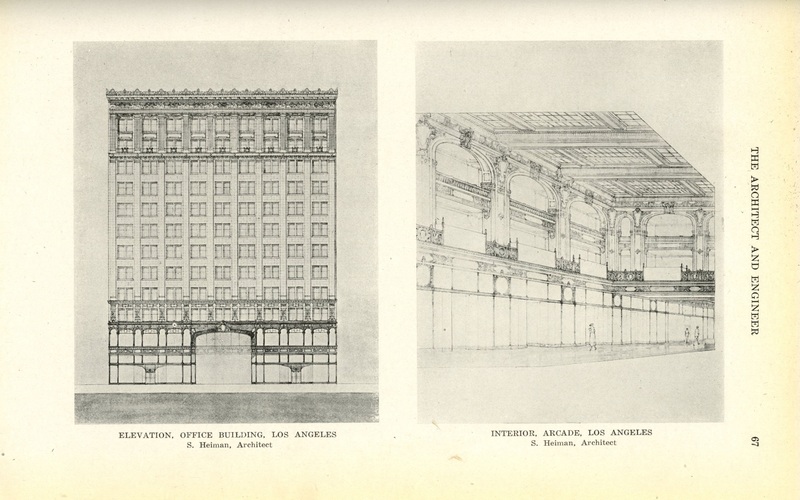 On January 10, 1923, The Los Angeles Times unveiled the Arcade Building’s design. 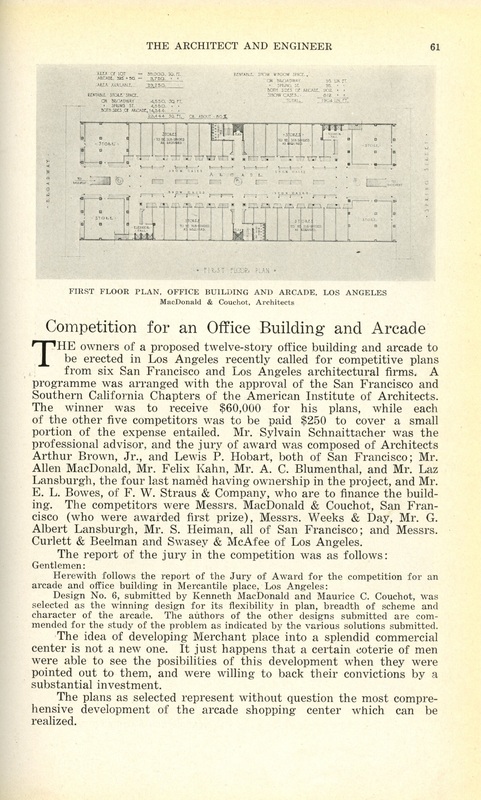 In an article in the paper’s second section titled Arcade Design Received, the Times stated the winning design had been forwarded to A.C. Blumenthal & Company of San Francisco. 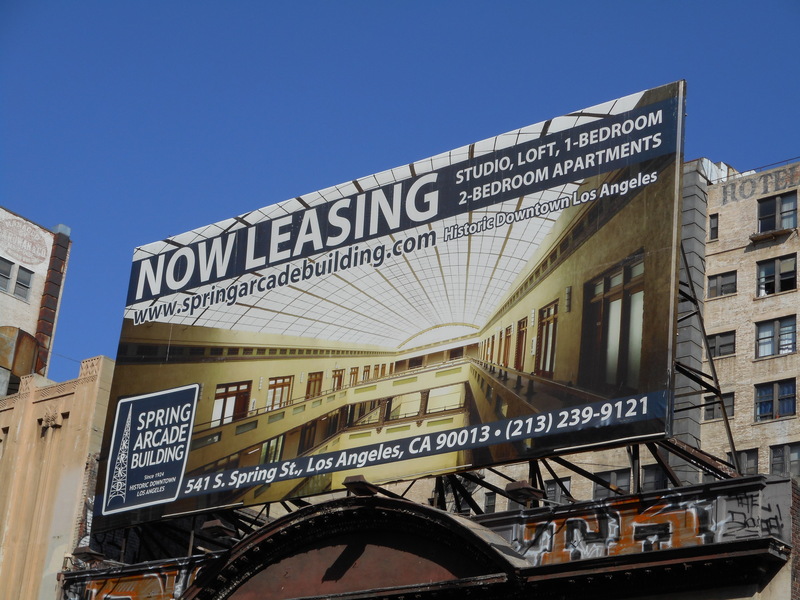 Mr.Blumenthal had recently purchased the parcel of land bordered by 5th and 6th streets and Broadway and Spring for the Arcade’s location. 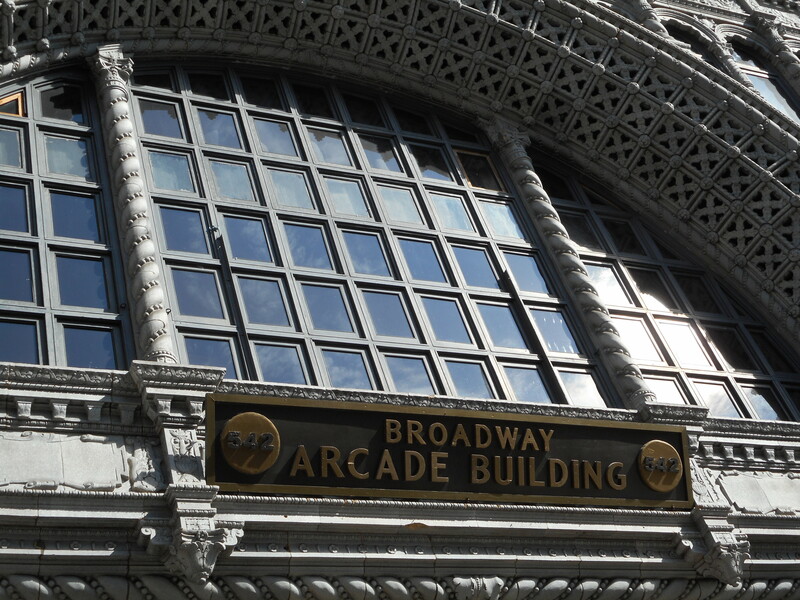 The new arcade would consist of twin towers — twelve stories high; one on Broadway and the other fronting Spring Street. Between the towers would be a three story arcade covered in glass. 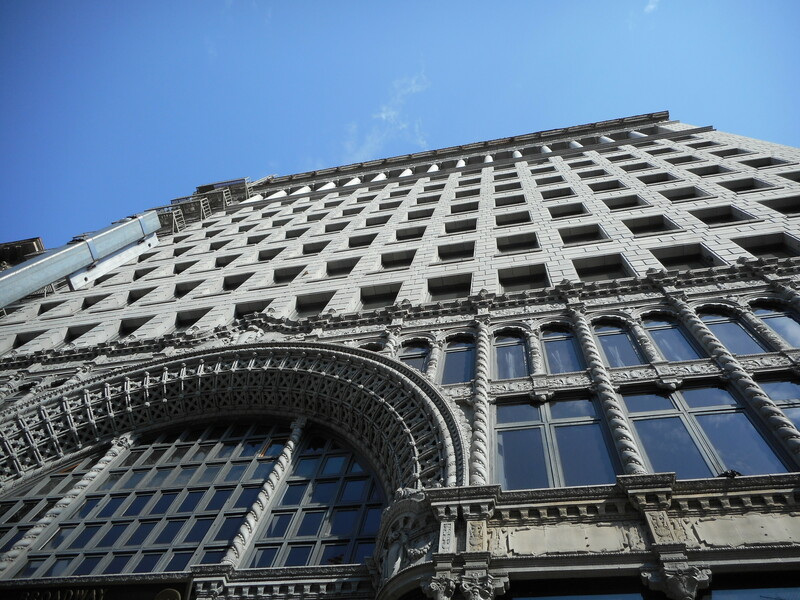 The first three floors of the office buildings and arcade would be devoted to stores and shops. High speed elevators would also be installed for the convenience of patrons. 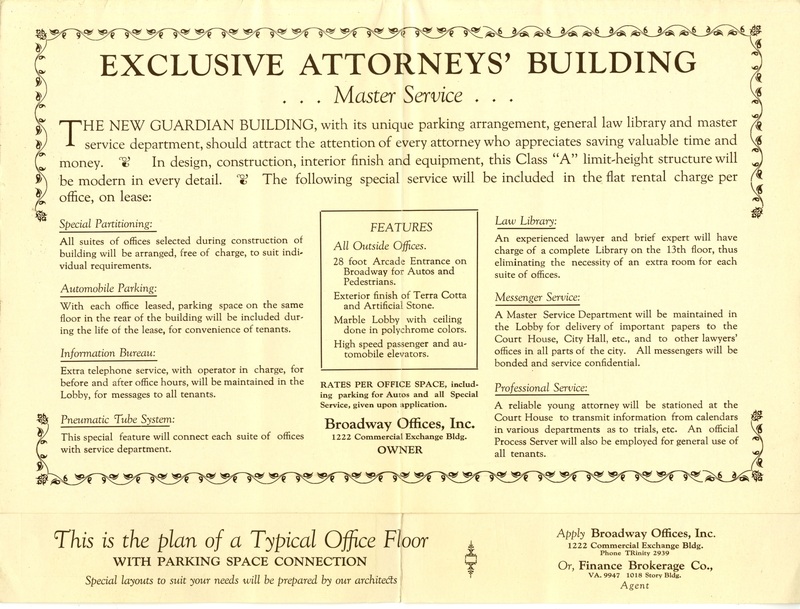 While the two office towers would be identical in style, the Spring Street skyscraper would be devoted to “investment and financial banking” while the Broadway side would be for general commercial offices. 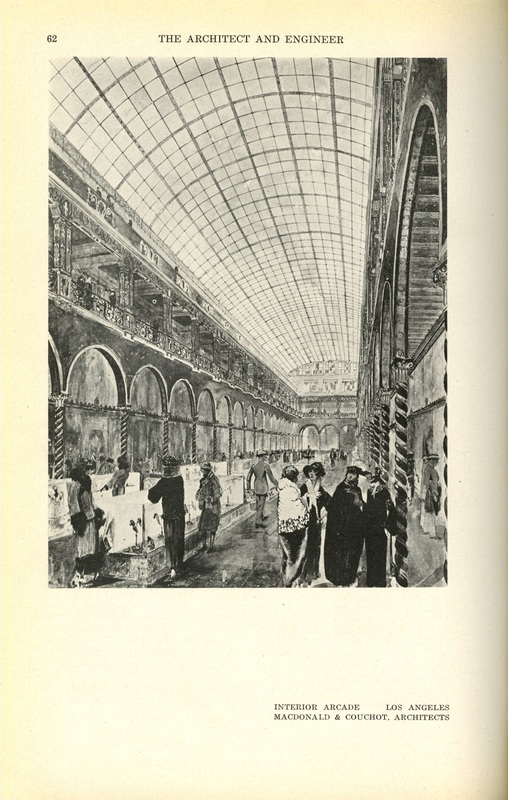 Tiled showcases were to grace the center of the Arcade for use by merchants on the second and third floors. 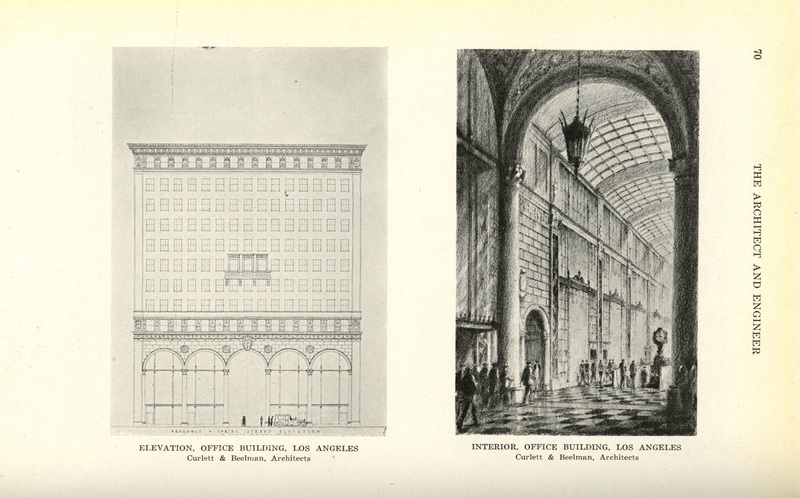 Thirty-five shops were planned for the street level and 400 offices were planned for the two office towers. 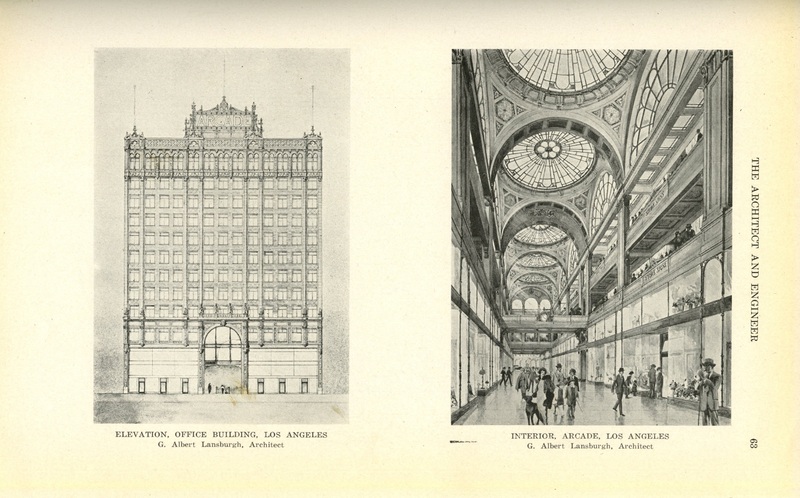 It was to be, according to Mr. Blumenthal, “the largest building erected by private enterprise in the city of Los Angeles.” Throughout the building wrought iron and decorative tiles would be used along with other elaborate ornamentation. 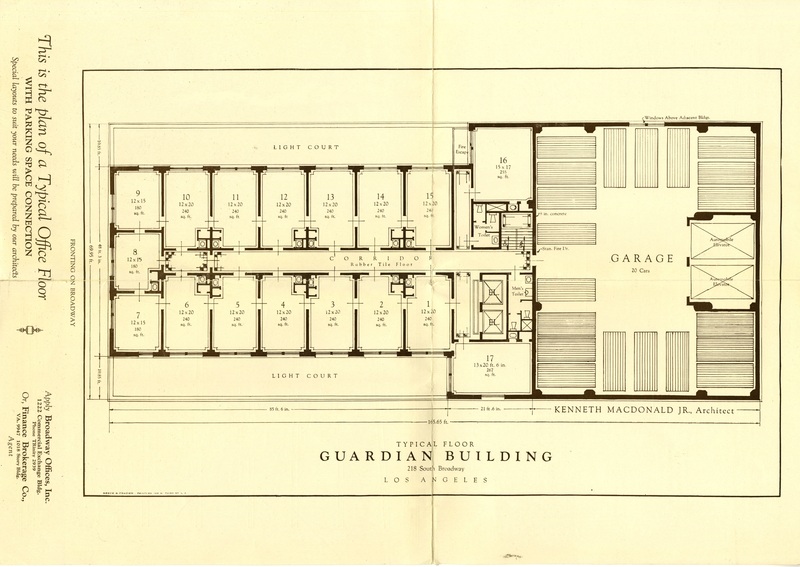 Two-thirds of the basement would be occupied by the Leighton Cafeteria. “Making it the largest cafeteria in the world.” The cafeteria would have a seating capacity of 1,500. Work was to begin April 1st with day and night shifts employed to execute the work as quickly as possible. 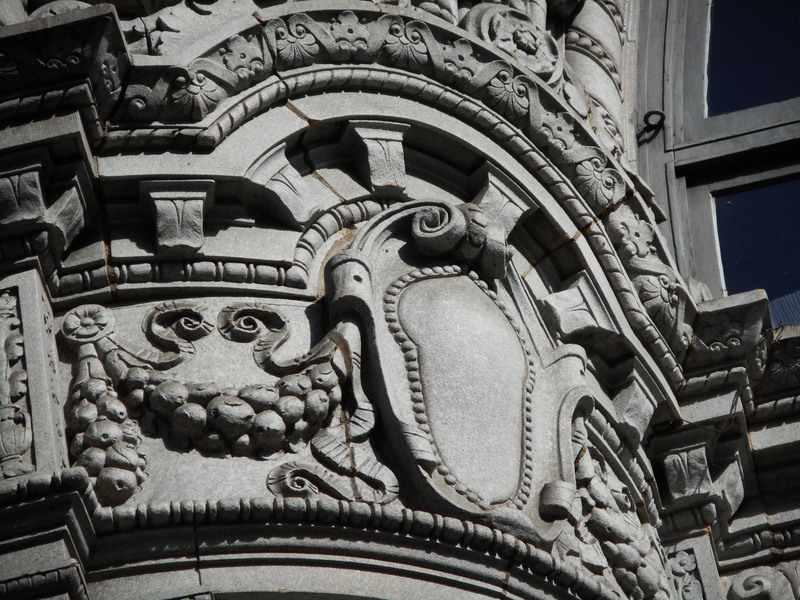 Completion of the project was set for January 1, 1924. 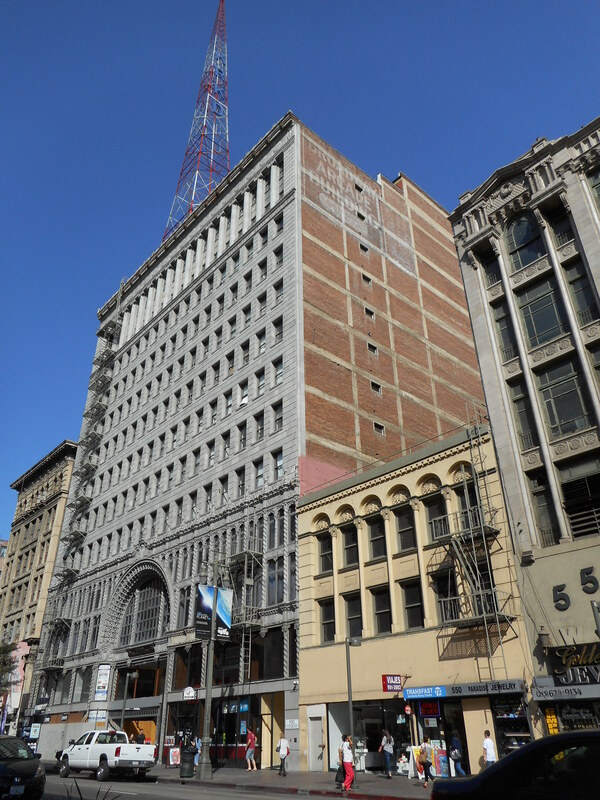 Many articles were written over the intervening months detailing the buildings progress and how office space and shop space were quickly being snatched up. There was a “hurry before it’s too late” aspect to some of the articles. 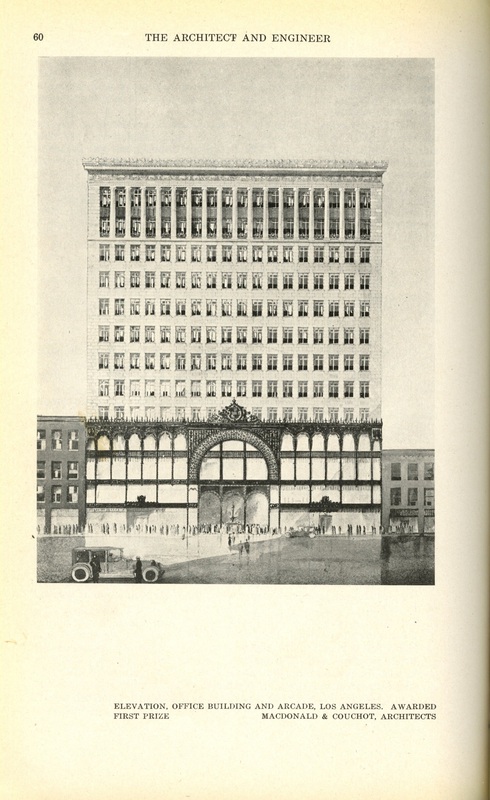 As the opening of the building neared newspaper coverage of the building increased. 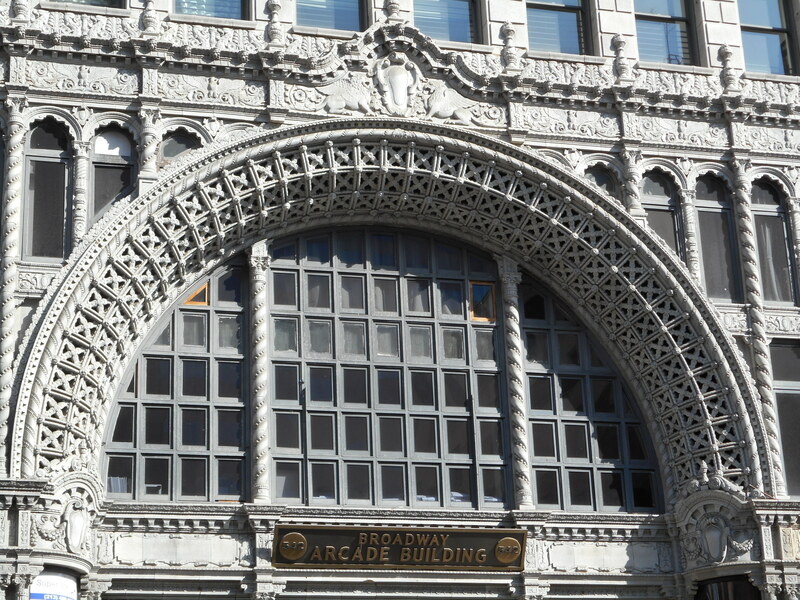 Olive Gray wrote an article titled, City Welcomes Arcade as Dream Comes True that summed up many aspects of the Arcade. 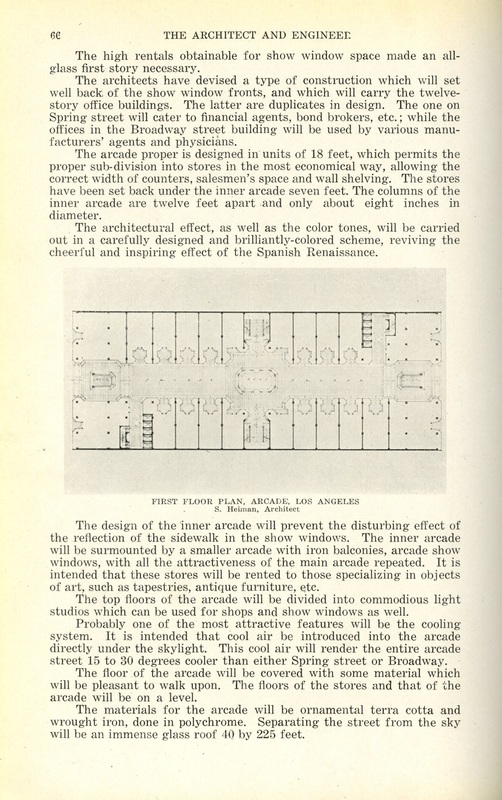 Gray pointed out an element that completely escaped me when she wrote that there was a practical reason for a merchants’ attraction to the Arcade: the rent. 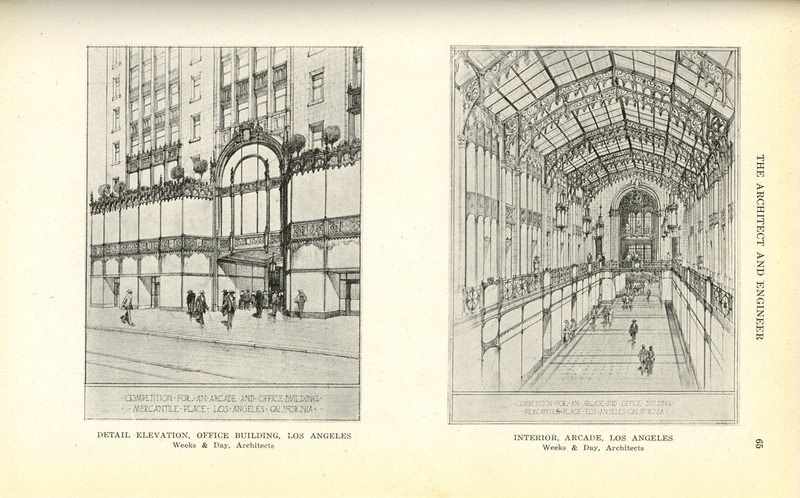 Gray states that many large downtown retailers had made it difficult for smaller shops to be noticed but the Arcade Building placed a large number of small shops together, under one roof, and the financial cost to the shop owner was relatively modest for increased visibility. Crane’s Barber Shop: they offered the standard barber shop services along with a manicure service and what they touted as a time saving service for clients — phone appointments. Desmond’s Men’s Shop: When the new Desmond’s store was completed the Arcade shop would remain open for those closer to the Arcade location. 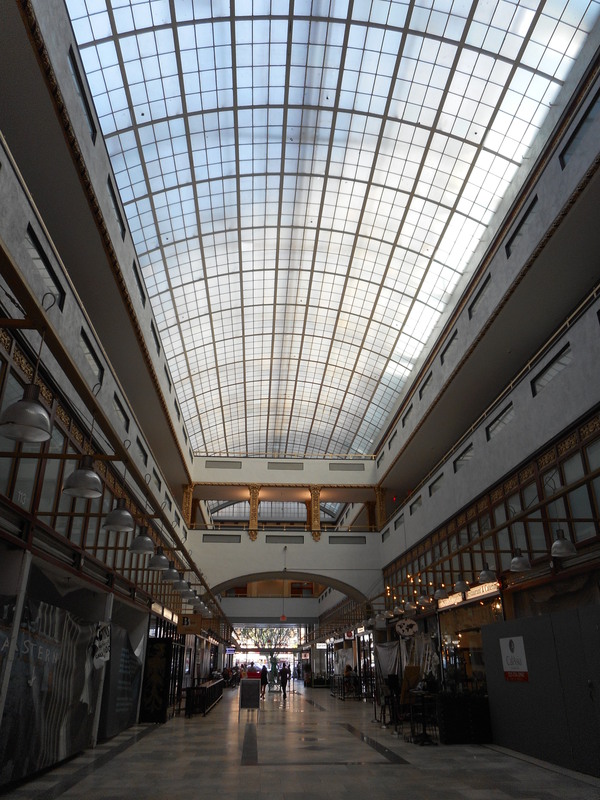 See’s Candy, which specialized in homemade candy, would open their sixth store in the Arcade. 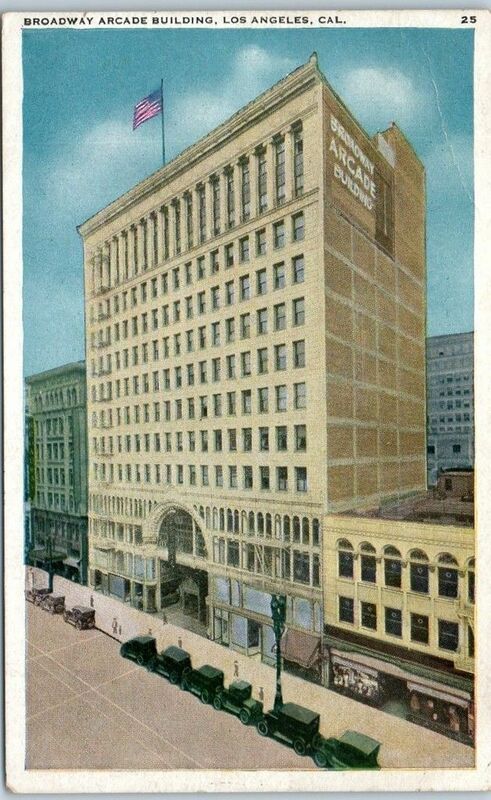 There were numerous articles in the Los Angeles Times about the building from various angles all dated February 15, 1924. 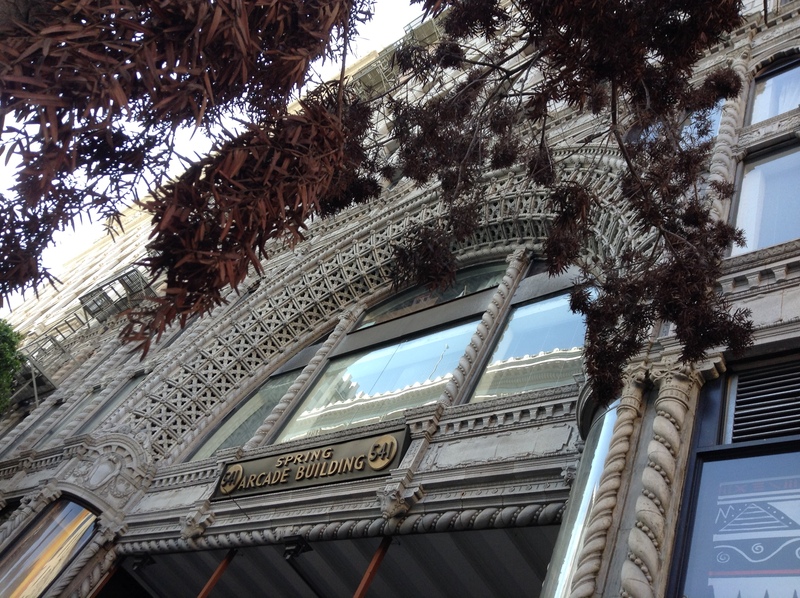 In one titled Problem Well Solved, the Arcade Building was assessed — logistically. 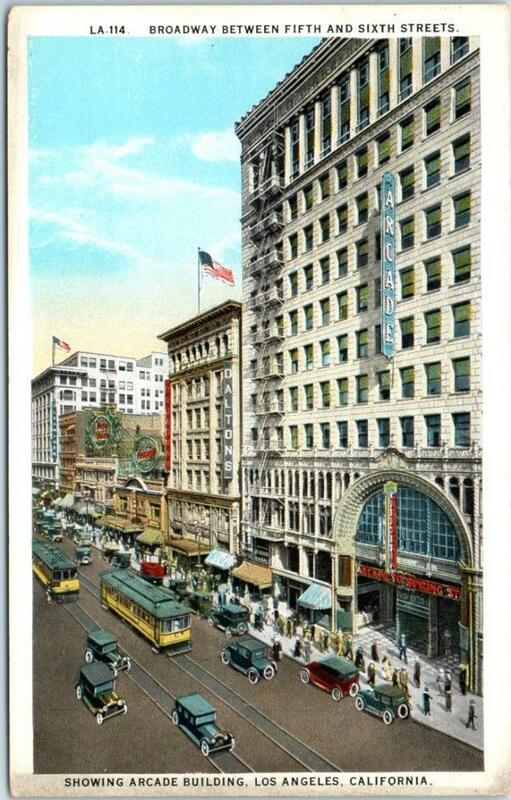 The author of the article (who was unnamed) saw the thoroughfare as a street beneath two skyscrapers and as a “more attractive means of communication” between Broadway and Spring streets than the crowded sidewalks of 5th and 6th streets. It was designed to resemble the Burlington Arcade in London. 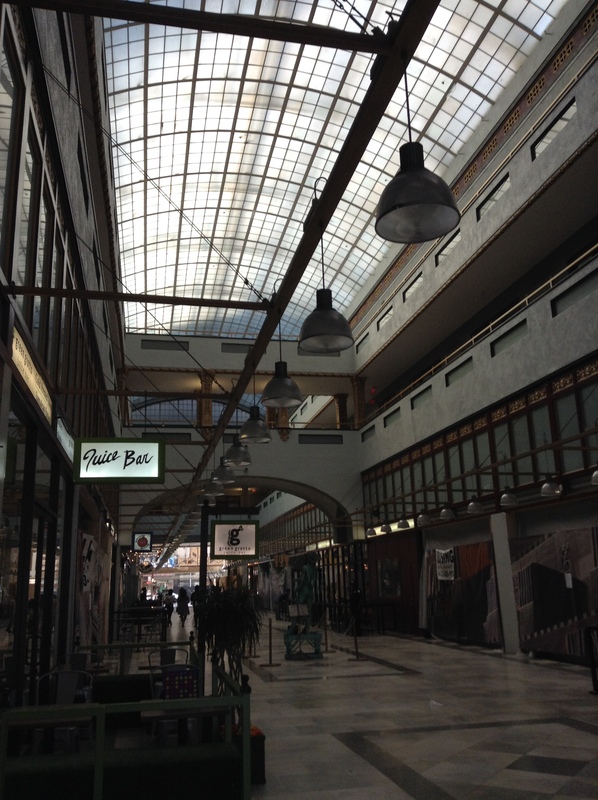 The Arcade’s walkway is 326 feet from one side to the other. Each entrance is 22 feet high. The total floor space for the building is 260,000 square feet. There were 350 offices upon completion. It had 1,200 windows and 1,100 doors. 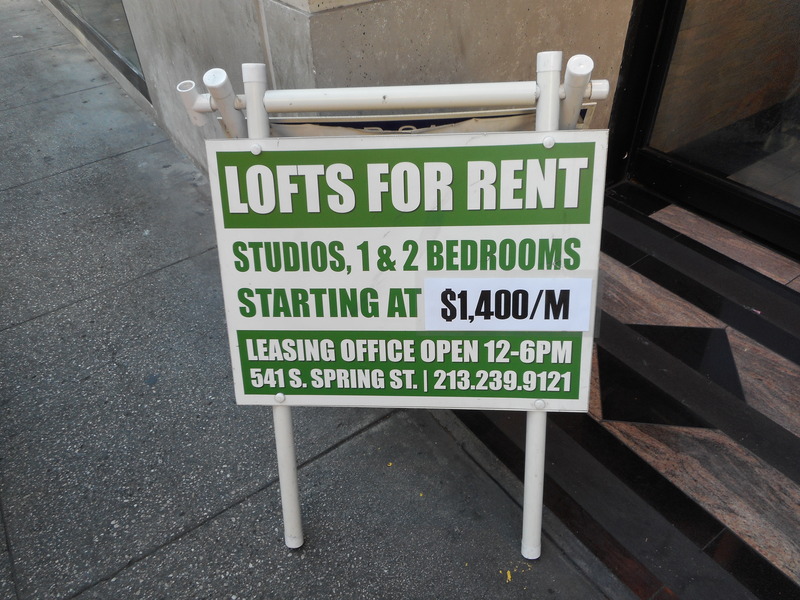 There are 2 floors below the street and twelve stories above. This “Opened on the Fourteenth” article delved into the history of the land and stated that the property was purchased for $12,500 in 1883 by the Board of Education. 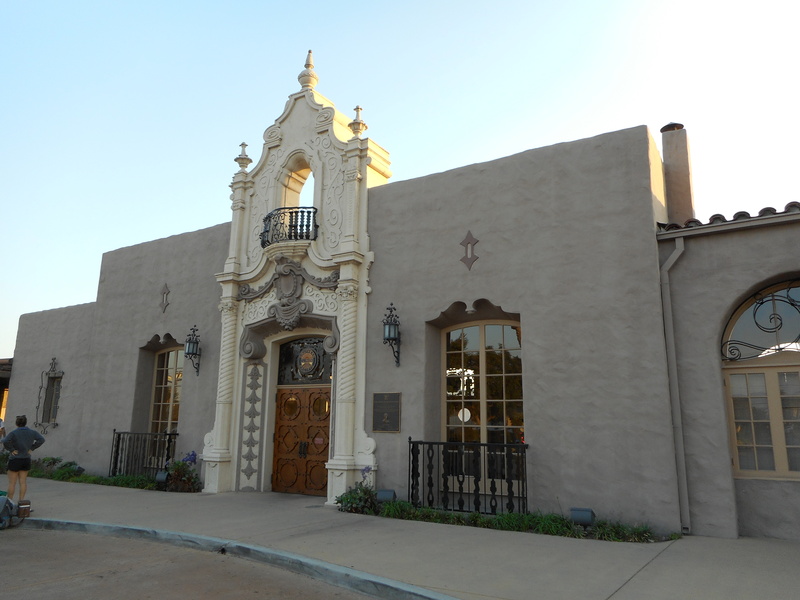 At the time, this purchase was considered foolish “price-wise” but the Board held onto the land until 1919 and then sold it, at auction, to Adolph Ramish for $1,550,000. 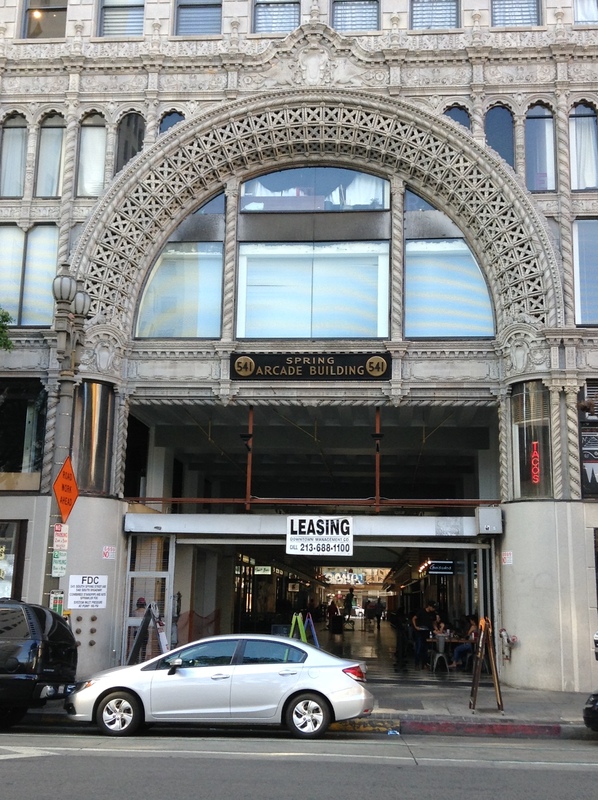 On January 3, 1923, Ramish signed the property over to the Arcade Realty Company for $1,910,000. 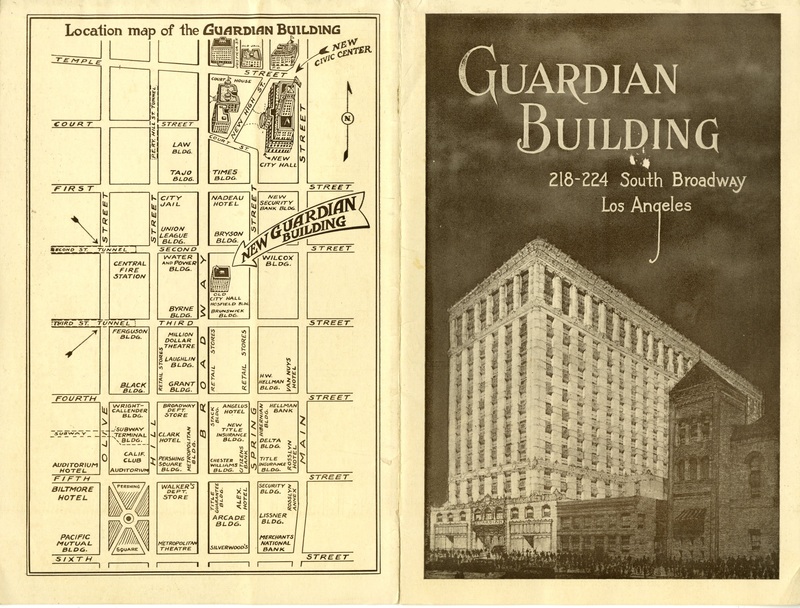 On February 14, 1924, the night before the building was opened to the public a celebration was held to commemorate the building’s completion and the festivities were organized by theater impresario Sid Grauman. The master of ceremonies for the night’s event was Will Rogers who was selected “because of his famed wit.” Speeches by various dignitaries, including Mayor Cryer, were followed by musical numbers and “several acts from the prologue of the Ten Commandments” direct from the Egyptian Theater. The evening was topped off by three dance orchestras that included Max Fisher’s orchestra, Abe Lyman’s orchestra and Leighton’s double orchestra. Dancing commenced at 10:30 pm and ended at 1 am. The building is still there. A great deal of renovation is taking place on the ground floor. On the Broadway side looking straight up. That lattice work is all terra cotta. On the roof of a building a couple of doors away (the old Cameo Theater built in 1915) is this advertisement. 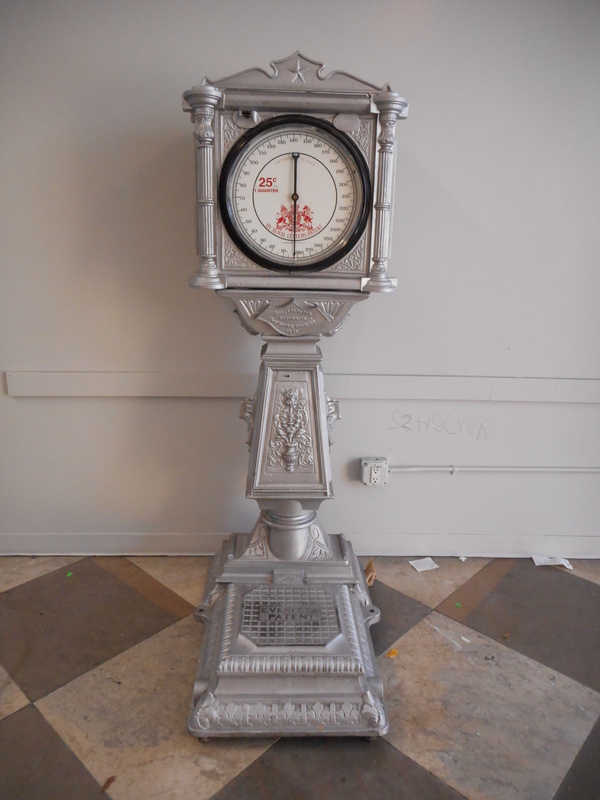 There is a scale at each entrance. I weighed myself and all I can say is I want my quarter back. When I first came to California, 28 years ago, and walked through this arcade it was filled with Latino people selling swap meet goods: cheap tube socks, clothes, radios, watches, boom boxes, toys, etc. It has been completely transformed. 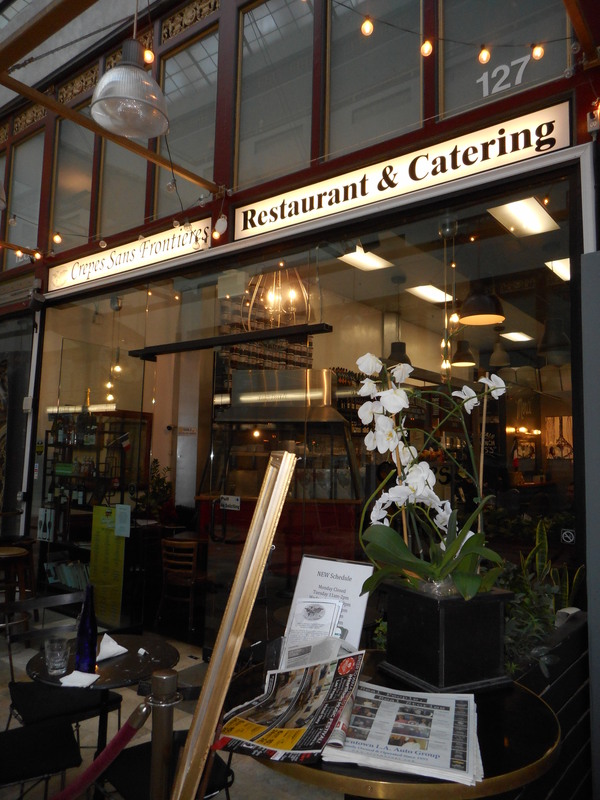 Upscale restaurants are selling crepes in the arcade now. A juice bar under the skylight. If there had been a der Wienerschnitzel I would have sat down and had a chili cheese dog with onions. Maybe, two and a large order of fries. 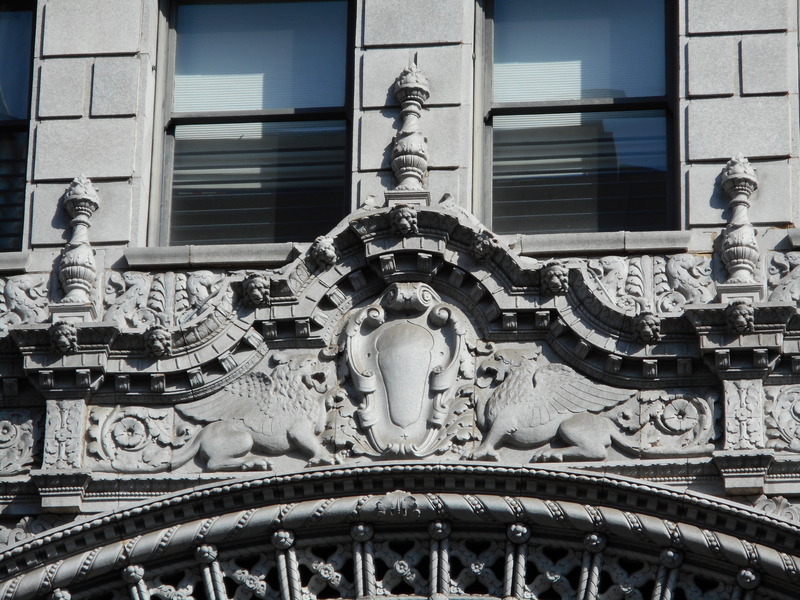 The Spring Street entrance is identical to the Broadway Street entrance. There was an article in Architect and Engineer that had images of some of the other entrants in the competition. I like the gothic interior above. That clock in the center of the arcade is a nice touch in this entry. 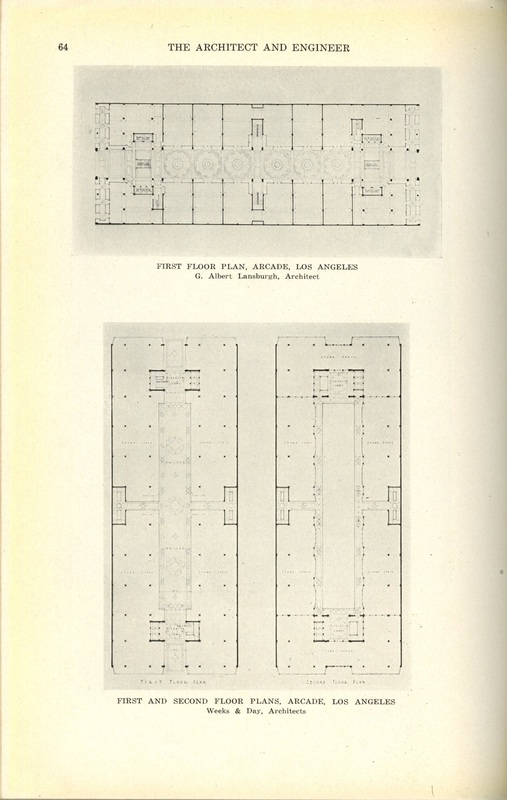 Kenneth MacDonald, Jr. also designed this train station in Glendale, California. 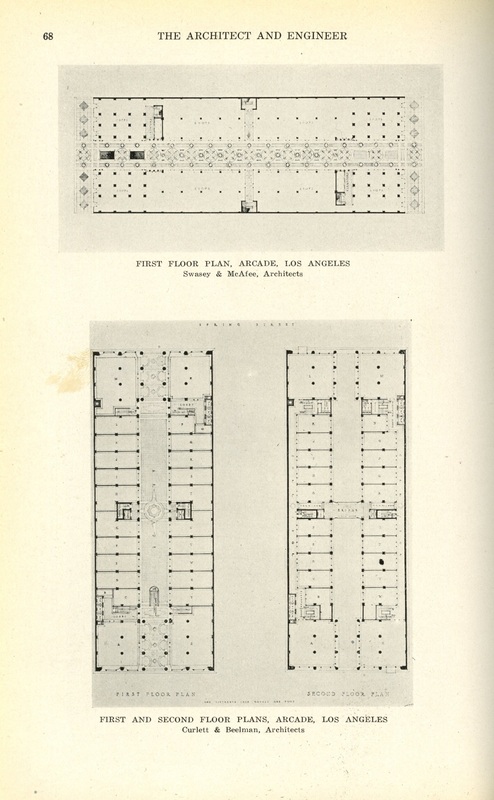 This is a pamphlet for a building that was never built; the front and back covers. It’s a MacDonald designed building. MacDonald’s name is on the right side under the architectural rendering of the garage location. This blurb is from American Architect. This announcement is from Southwest Builder and Contractor. The structure was never built. 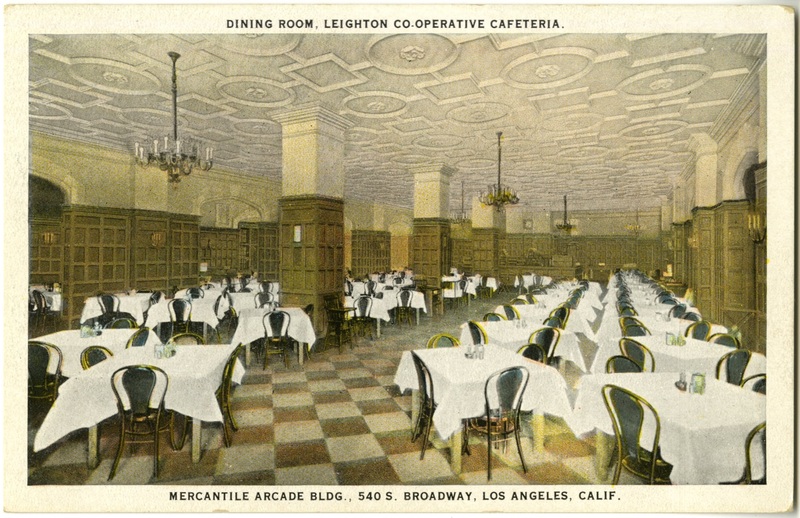 Leighton’s Cafeteria eventually took up the entire basement of the Arcade Building. Arcade design received. (1923, January 10). Los Angeles Times, p. II1. Class A hotel. (1924, May 2). Southwest Builder and Contractor, 63(18), 56. Competition for an office building and arcade. (1923, February). Architect and Engineer, 72(2), 60-70. Facts, figures given. (1924, February 15). Los Angeles Times, p. 9. Giant new Arcade to be opened. (1924, February 14). Los Angeles Times, p. A2. Gray, O. (1924, February 15). 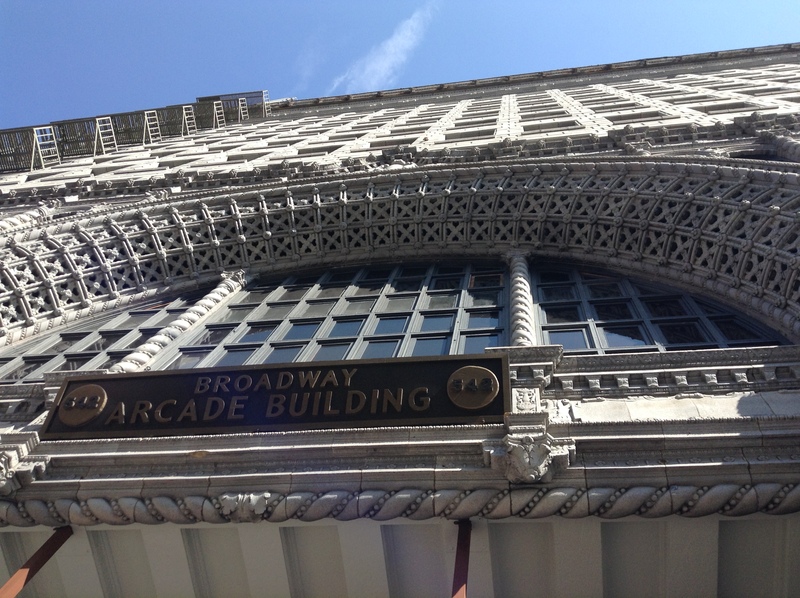 City welcomes Arcade as a dream come true. Los Angeles Times, p. 9. Personals. (1923, October 24). 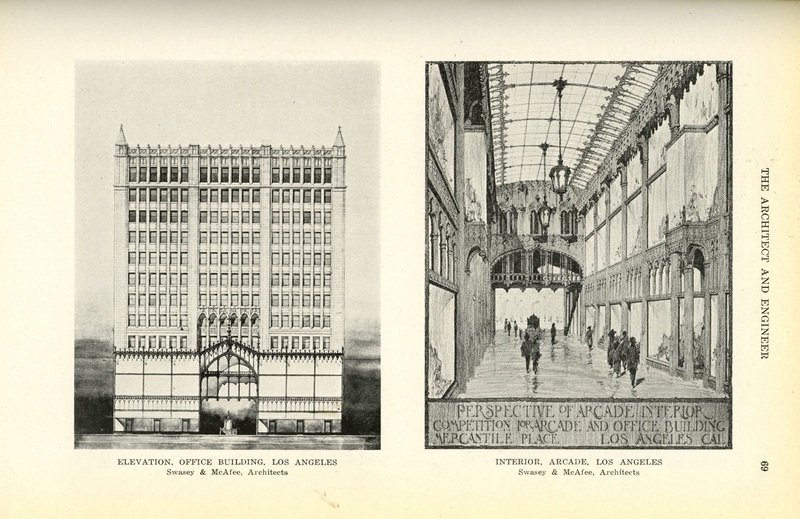 American Archtect – The Architectural Review, 124(2431), 18. Problem well solved. (1924, February 15). Los Angeles Times, p. 13. To be opened on the fourteenth. (1924, February 10). 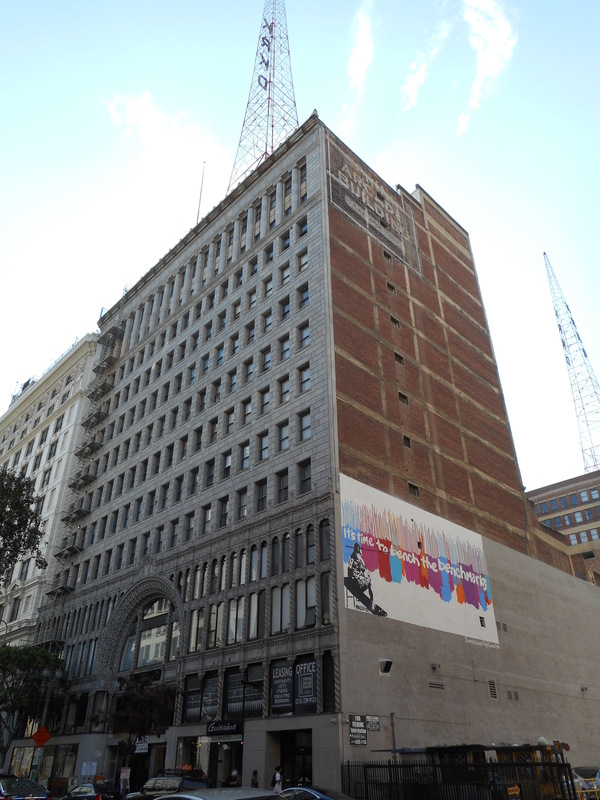 Los Angeles Times, p. D7.